Context: Hexapod fixators can be divided into two basic design groups. One group consists of frames that use ball and socket joint struts attached to the outer surface of the rings. The other group consists of frames that use cardan type universal joint struts attached to the under surface of the rings. 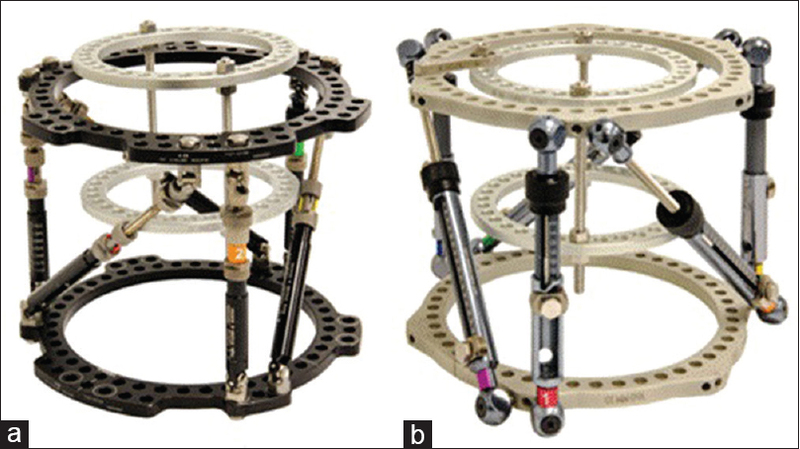 Aims: To compare the ability of different hexapod fixator systems for deformity correction. 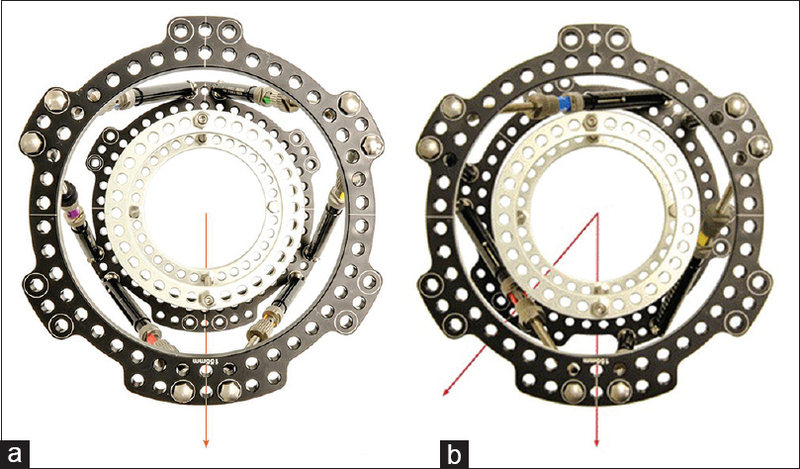 Settings and Design: Nearly, identical two-ring frame constructs were compared to determine if there was any difference in deformity correction capability between cardan type universal joint struts and ball and socket joint struts. Materials and Methods: Maximal deformity was created using the software for each of the frame constructs in all six planes of deformity (angulation, translation, and rotation in the coronal and sagittal planes). Clinical scenarios were also compared (equinus contracture, moderate Blount disease, and severe Blount disease) and the number of strut changes necessary to correct the deformity were recorded. Results: For the small and medium-sized struts, the angular deformity corrections were similar, but the cardan type universal hinges had a greater capability for correcting translational deformity and rotation than the ball and socket joints. However, the amount of lengthening possible was greater for the ball and socket joints with these strut sizes. In the largest size of struts, the ball and socket joints had greater range in every category except rotation. In patients requiring significant rotational correction, the cardan type universal joints were found to impinge on the soft tissues 13° earlier than the ball and socket joints (39° vs. 52°). A Blount disease case with moderate multiplanar deformity and an equinus correction of 45° required the same amount of strut changes for each design. For the Blount disease case with severe multiplanar deformity, the cardan type universal joint struts required six total changes, whereas the ball and socket joint struts required only one strut change and two strut adjustments to achieve the same correction. Conclusions: Both the cardan type universal joint and the ball and socket joint hexapod frame designs allow substantial multiplanar corrections to occur. In the smaller size struts, the cardan type universal joints allow more translation and rotation, whereas the ball and socket joints allow more length. For large rotational corrections and frames built with 90° of offset, the ball and socket joint design is better at avoiding soft tissue impingement. While both systems are comparable with mild to moderate deformity correction, the ball and socket joint design allows more correction with less strut changes for patients with severe deformity in our experimental construct. 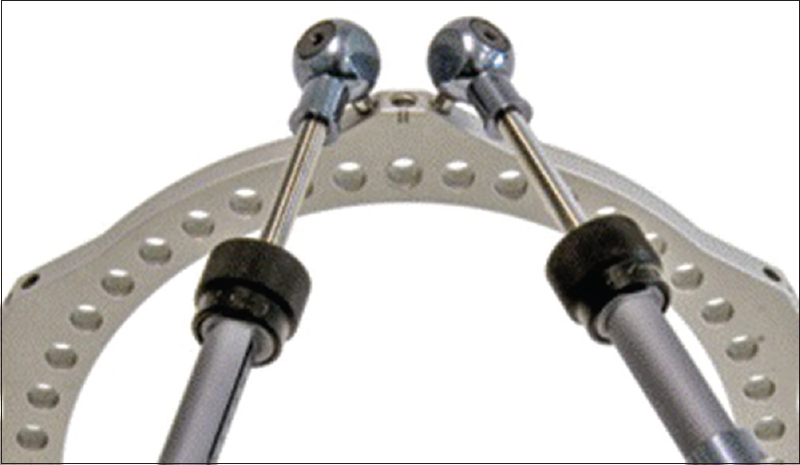 Hexapod circular external fixators are the current state of the art technology for limb deformity correction. They represent advancement over traditional circular external fixators based on physical hinges. Hexapod systems are paired with computer software that allows the surgeon to use virtual hinges instead of physical hinges. Using the virtual hinge, the surgeon can correct multiple planes of deformity simultaneously or sequentially without having to change the frame construct or take the patient back to the operating room. 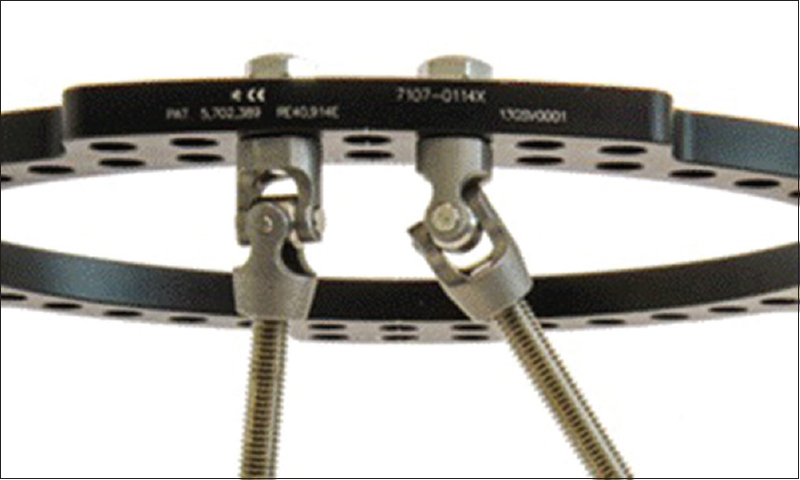 Multiple hexapod-type external fixators are now available for surgeons to use. , The design of these fixators can be divided into two types of systems: (1) Rings connected by struts that utilize ball and socket joints attached to the outer surface of the ring [Figure 1]; and (2) rings connected by struts that utilize a cardan type universal joint attached to the inner surface of the ring [Figure 2]. This study compares the range of clinical capabilities of each hexapod design and identifies any advantages and disadvantages associated with each type. 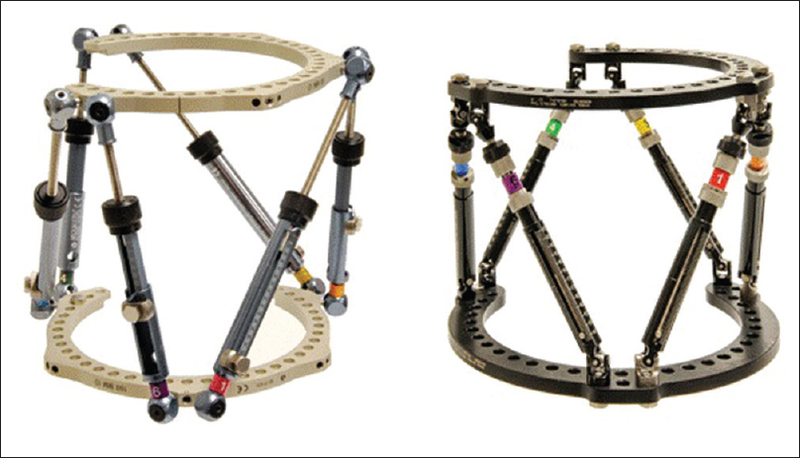 A hexapod frame consisting of two rings and six struts was constructed using each design type, the cardan type universal joint and the ball and socket joint. The cardan type universal struts were attached to the appropriate tabs on the undersurface of the rings. The ball and socket joint struts were attached to the appropriate tabs on the outside of the rings. The ring sizes were chosen to match in size as closely as possible. The internal diameter of the rings measured 155 mm for the cardan type universal joint and 160 mm in diameter for the ball and socket joint. 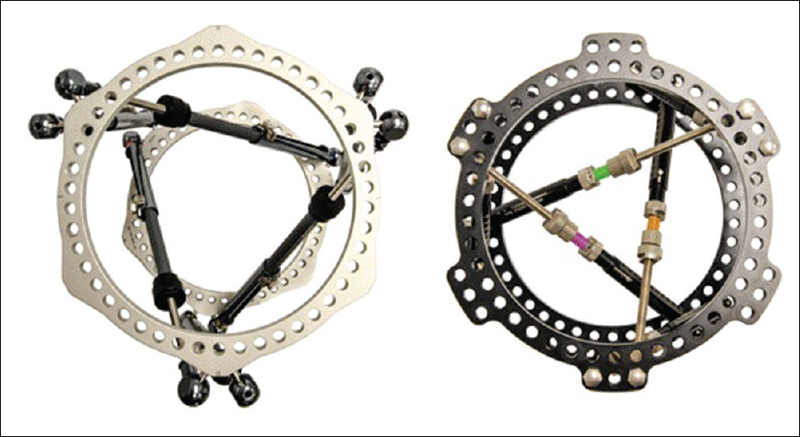 Three different sets of strut sizes were tested on each ring, small (short), medium, and long. Starting with each strut in the neutral position, the frames were deformed into maximum coronal plane angulation, sagittal plane angulation, coronal plane translation, sagittal plane translation, rotation, and length. For each of these configurations, the software was used to create the maximum amount of each deformity until the limit of each particular strut size was reached. The deformities were pure in each plane without any induced secondary deformity. For example, to create the maximum amount of coronal plane angulation (varus/valgus), the amount of varus deformity was increased gradually using the software until the limit of that particular size of struts was reached [Figure 3]. All of the other deformity parameters were left at zero. The frames were then built using the software's prescription for each of the strut lengths. The frames were photographed and measured to confirm the software's strut length recommendations for each deformity. The second set of tests were performed to determine the amount of deformity correction possible before soft tissue impingement inside the rings would occur. A ring block was created using 100 mm diameter rings connected with threaded rods. This ring block was placed inside the 155/160 mm rings with struts to simulate the soft tissue diameter of a patient [Figure 4]. The rings were rotated until the struts started to touch the 100 mm ring block indicating soft tissue impingement. This was also tested using 155/160 inner diameter 5/8 rings connected with the opening of the rings rotated 90° externally relative to each other as would be used in a femur or humerus construct (i.e., the proximal ring is open medially, and the distal ring is open anteriorly or posteriorly) [Figure 5]. Using the software, the third set of tests was performed to evaluate the amount of strut changes necessary to achieve full correction of several different clinical deformities. For Blount disease, two different deformities were created based on real previous patients, one with moderate deformity parameters, and one with severe deformity parameters. Each frame was built with an 180 ring proximally and a 155 or 160 mm ring distally. The frames were constructed with the same distance between the rings on the fictional patient. An equinus deformity was also created. The frame construct was similar for each with 155 or 160 mm inner diameter rings placed on the distal tibia and 155 or 160 mm inner diameter foot rings placed on each foot. The distance between the rings was identical in each case. Finally, using the medium-sized struts set at neutral strut length, a frame was constructed using the cardan universal joints and the ball and socket joints and the 155/160 mm inner diameter rings. The amount of space available for half pins and wire placement between the ring and the struts was evaluated and photographed. *The 100 mm frame placed inside the rotated frames is just to give the reader a reference that highlights the differences. It is purely a visual aid. We are not suggesting that anyone build a frame that close to the limb in real-life. The results of the short/small struts for each type are demonstrated in [Table 1]. The results of the medium struts for each type are demonstrated in [Table 2]. The results of the long struts for each type are demonstrated in [Table 3]. Simulated soft tissue impingement started when the cardan type universal joints were rotated 39° [Figure 6]. Simulated soft tissue impingement started when the ball and socket joints were rotated 52° [Figure 7]. 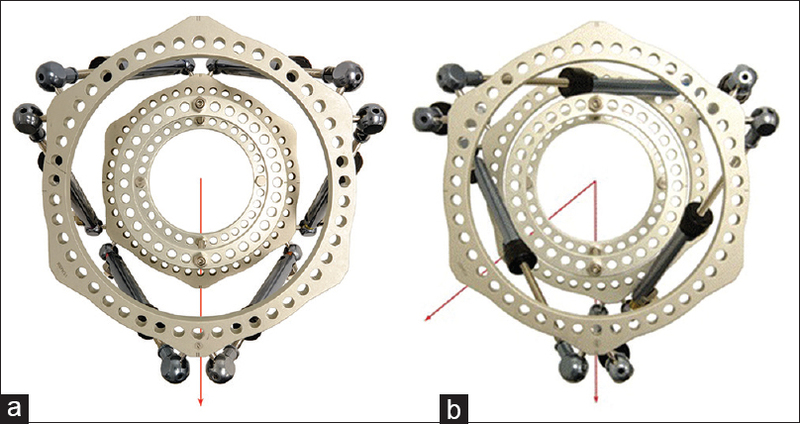 The frame construct consisting of two 5/8 rings with the openings rotated 90° relative to one another showed decreased space between the soft tissue and the struts with the cardan type universal joints compared to the ball and socket joints [Figure 8]a and b. There was increased space available for a half pin or wire fixation with the ball and socket joints compared to the cardan universal hinge joints [Figure 9]a and b. A Blount disease patient with moderate deformity (36° varus, 15° of apex anterior, 20° of internal rotation, and 8 mm of shortening) was entered into the software program for each style of hexapod frame. Each frame construct had the same ring sizes and distance between rings. Both the cardan type universal joints and the ball and socket joints required 3 strut changes to achieve full deformity correction. A Blount disease patient with severe deformity (54° varus, 51° apex anterior, 30° of internal rotation, and 8 mm of shortening) was entered into the software program for each type of hexapod frame. Each frame construct had the same ring sizes and distance between the rings. The cardan type universal joints required six strut changes to achieve full correction. The ball and socket joints required one strut change and two strut adjustments to achieve full correction. For a patient with 45° of equinus deformity, two strut changes are needed for both the cardan type universal joint struts and the ball and socket struts to achieve full correction for identical frame constructs. *A strut adjustment refers to adjusting the length of the strut without having to exchange the strut for new and different strut. The ball and socket struts are designed to allow acute and gradual correction with each strut. One of the key design features of any hexapod frame system is the desired balance between strut range of motion capabilities and strut stability. Cardan type universal joints tend to have a greater range of motion than ball and socket joints. Ball and socket joints, however, tend to have more stability than cardan type universal joints. This study compares the clinical capabilities of the two basic frame designs. Using the software, the maximum single plane deformity that could be fully corrected by each strut size was determined for each design type. The results are summarized in [Table 1] [Table 2] [Table 3]. For the small and medium-sized struts, the angular deformity corrections were similar, but the cardan type universal hinges had a greater capability for correcting translational deformity and rotation than the ball and socket joints. However, the amount of lengthening possible was greater for the ball and socket joints with these strut sizes. In the largest size of struts, the ball and socket joints had a greater range in every category except rotation. 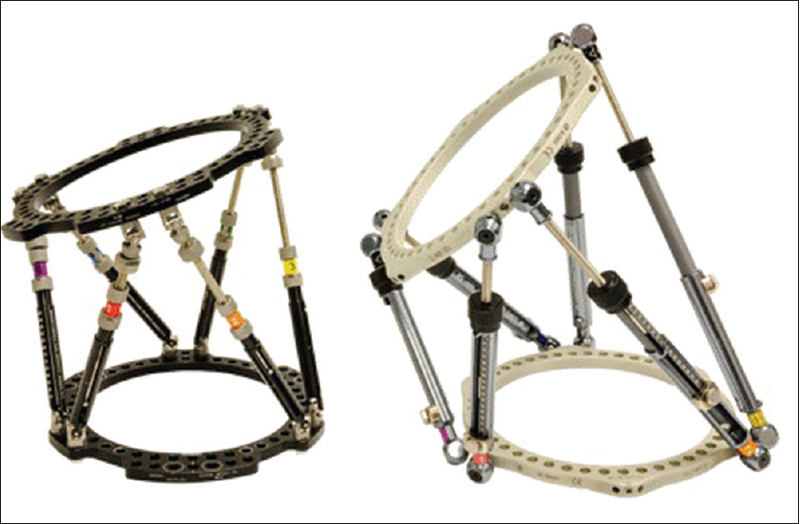 Several clinical scenarios were tested with identical constructs from each type of hexapod frame design. In patients requiring significant rotational correction, the cardan type universal joints were found to impinge on the soft tissues 13° earlier than the ball and socket joint (39° vs. 52°). This is likely related to the attachment points for the struts. The cardan type universal joints attach inside the rings compared to the ball and socket attachment on the outside of the ring. This places the cardan type universal joints closer to the soft tissues. As the amount of rotation increases, the cardan type universal struts begin to encroach on the soft tissues until it is impossible to clinically continue rotating. Our experiment with 100 mm rings inside the 155 mm ring leaves a somewhat smaller space between the rings and the soft tissues than the usual recommendation of leaving a two-finger breadth space between the rings and soft tissues. However, in practice, it can and does happen at times that smaller rings are mounted inadvertently. Under these circumstances, the reduced amount of rotation achievable by the cardan type joints compared to the ball and socket joints should be considered by the clinician. Although the software allows for a greater amount of potential rotation with the cardan type universal joints, not all of this rotation is clinically feasible [Figure 10]. The cardan type universal joint frame would impinge on the soft tissues before the entire rotation could be completed. A common clinical scenario is to build a frame using two 5/8 rings instead of full rings. These are often used on the femur or the humerus. The openings of the rings are usually arranged to be 90° offset from one another to make the frames fit the limb better. For example, on the femur, the proximal ring opening usually faces medially and the distal ring opening faces posteriorly. In this arrangement, the cardan type universal hinges were more prone to soft tissue impingement than the ball and socket joints. The frame constructs were also compared to each other regarding the number of strut changes necessary to complete a deformity correction. A Blount disease case with moderate multiplanar deformity required the same amount of strut changes for each design. Similarly, an equinus correction of 45° also required the same amount of strut changes for both designs. The severe multiplanar Blount disease patient, however, did show a difference between the two designs. With the same size rings and the same distance between the rings, the cardan type universal joint struts required six total changes, whereas the ball and socket joint struts required only one strut change and two strut adjustments to achieve the same correction. Fewer strut changes are important for two reasons. One, less clinic time is consumed managing the strut changes which allows for a more efficient use of health-care personnel time and resources. Second, using fewer struts translates into cost savings to the patient. Finally, in the severe Blount disease patient, it was noted that the ball and socket joint frame had the capability to be built with the rings closer together than the frame with the cardan type universal joints. This option may be beneficial in short, deformed pediatric limbs. In summary, both the cardan type universal joint and the ball and socket joint hexapod frame designs allow substantial multiplanar corrections to occur. In the smaller size struts, the cardan type universal joints allow more translation and rotation, whereas the ball and socket joints allow more length. For large rotational corrections and frames built with 90° of offset, the ball and socket joint design is better at avoiding soft tissue impingement. While both systems are comparable with mild to moderate deformity correction, the ball and socket joint design allows more correction with fewer strut changes for patients with severe deformity. We would like to thank Jordan Grauer for assistance with preparation of this manuscript. Christopher Iobst, MD, is an educational consultant for Ellipse Technologies, Orthofix International, and Smith and Nephew. Solomin L, Vilensky V, Utenkin A, Terrel W. The comparative analysis of computer assisted devices and Ilizarov device reduction capabilities. Genij Orthopedii 2009;1:5-10. Solomin L, Vilensky V, Utenkin A. Clinical and Experimental Comparison of External Fixation Devices on the Base of Computer Navigation. Proceedings of the 6 th SICOT/SIROT Annual International Conference, Abstract #19461, Pattaya, Thailand; 2009. Paloski M, Taylor BC, Iobst C, Pugh KJ. Pediatric and adolescent applications of the Taylor Spatial Frame. Orthopedics 2012;35:518-27. Ganger R, Radler C, Speigner B, Grill F. Correction of post-traumatic lower limb deformities using the Taylor spatial frame. Int Orthop 2010;34:723-30. Marangoz S, Feldman DS, Sala DA, Hyman JE, Vitale MG. Femoral deformity correction in children and young adults using Taylor Spatial Frame. Clin Orthop Relat Res 2008;466:3018-24. Naqui SZ, Thiryayi W, Foster A, Tselentakis G, Evans M, Day JB. Correction of simple and complex pediatric deformities using the Taylor-Spatial Frame. J Pediatr Orthop 2008;28:640-7. Ferreira N, Marais LC, Aldous C. Hexapod external fixator closed distraction in the management of stiff hypertrophic tibial nonunions. Bone Joint J 2015;97:1417-22. 1 CORR Insights®: What Are the Biomechanical Properties of the Taylor Spatial Frame™?